Home » Kitchen Help Category » Faucets » Five designs of metal rimmed kitchen sinks — howdy, hudee! 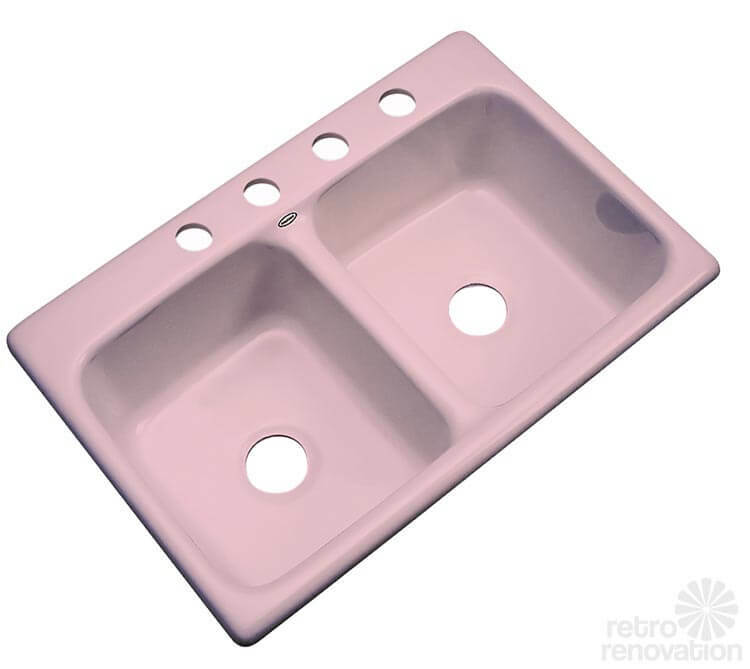 Five designs of metal rimmed kitchen sinks — howdy, hudee! So exciting — the biggest discovery of the year, I am pretty sure, and it’s only February: Thanks to reader Sarah for prompting me to contact Ceco Sinks. This company manufacturers porcelain enamel on cast iron plumbing fixtures — and they offer FIVE designs of metal rimmed porcelain on cast iron kitchen sinks — in both single- and double-bowl styles. Ceco also offers two metal-rimmed bathroom sinks that accommodate 8″ faucet spreads — the only source for this configuration that we know of. Also super important info! This is big news for Retro Renovators who, previously, thought they were limited to Kohler’s single design selection. 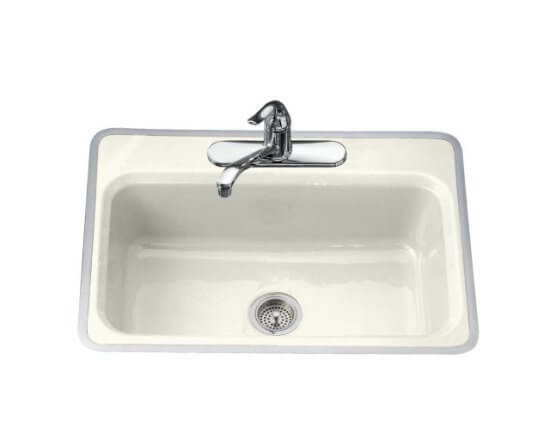 Above: Seaside single bowl, metal-rim kitchen sink – porcelain enamel on cast iron, from Ceco sinks. Continue reading to see the other four designs! Above: San Clemente metal-rim, double bowl kitchen sink. Note: The three designs above — all with integral ledges with holes drilled to hold a faucet — are probably the best choices for Retro Renovator doing a period style kitchen from the 1950s on. Above: Little Corona — Several model numbers shown, check with Ceco to understand which to choose for your use. Above: The #732 (no name) can be installed with a hudee ring, the company told me. Above: And the #732 (no name) also can take a hudee. “Hudee ring,” you ask? Read all about hudee rings here — be in the know! 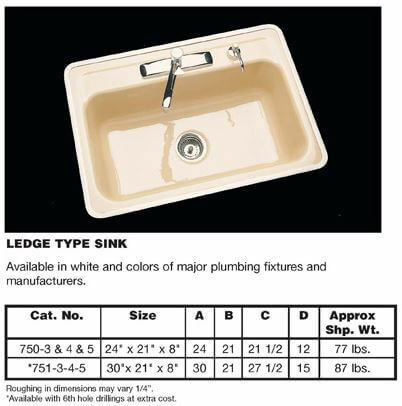 Ceco Sinks does not sell directly to the public — they are a wholesaler. To order one of their sinks, try a local plumbing supply store (not a big box store, though) to see if they can order the sink for you. If you have any trouble, call the company, and they can direct you to the nearest regional distributor. The company tells me their prices are competitive with — maybe even 10-15% less than –Kohler, as one example. However, depending on how close you are to a distributor, shipping charges may be required, which would affect the total price. The sinks come in six neutral colors — white, biscuit, almond, bone, platinum (similar to Kohler’s ice grey) and black. I am in the same situation. My 1950 kitchen drain sprung a leak, and while I was plumbing, decided to install a new sink and faucet (photos available). Currently have the ‘rimless’ or ’tile-in’ type with the metal ring. The exact replacement is the Kohler Delafield, which Lowes discounts 1/3 off Mfg retail price. Looks like it will be $303 for the sink and $57 for the trim ring, not terribly much more than a standard cast iron model that goes for $299. This is a current model on the Kohler website and my store seems to think no difficulty in ordering it. Model is K5950-4 (4 hole top is all that is made) and the metal frame is K6601. Hope this helps. Might I add, in my case, an exact replacement size is called for as the opening is precisely awkward32x21, and that is with carving a bit of the sides out of the cabinet support. 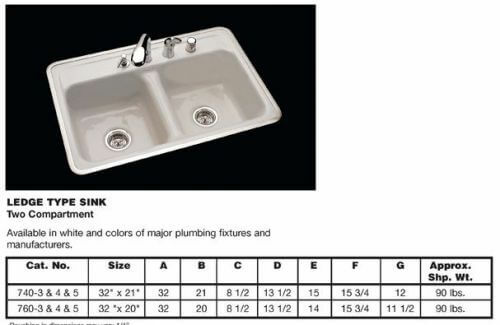 The standard opening in modern kitchen sinks is 33×22! In order to not reconfigure my cabinets, which would necessitate losing my red Moonglo Formica, and save a whole lot of money, I’ve decided to just replace with like kind. Nice to know that Hudee offers so many different styles still for the retro remodeler! Verna, you need to contact Vance Industries, profiled and linked to in the story — good luck! 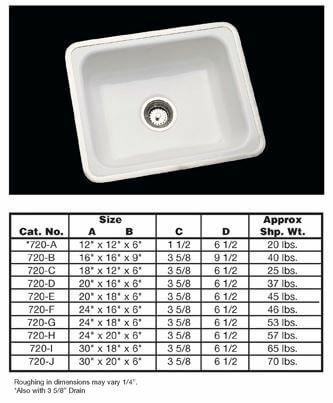 I just purchased a Ceco ‘Little Corona’ model #720 sink and found out that sizes A through E have been discontinued. 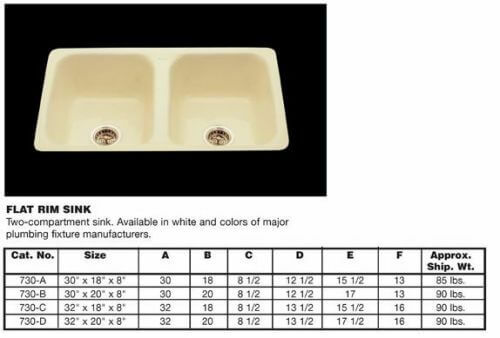 On top of that, they are only producing white sinks, even though the literature says that they have several colors. I got mine in Biscuit, but was told it was the last one on the rack at the factory. The Hudee rings are available but sold separately, so make sure you ask for one. I suppose that some of the discontinued lines are still out there sitting on a local plumbing supply house shelf, but more and more supply houses are not carrying the stock locally. I was originally looking for a smaller size in a color other than white but failed. I settled for a larger size that I am going to shoe horn into my cabinets. I’m just happy I was able to get it in Biscuit. I just spoke to Ceco and he was telling me that the 751 has been discontinued for about 8 years now. He said the only one that can still be ordered with a ring are the two compartment ones. And he wasn’t able to help me with any stockists that still might carry some of the discontinued models. ugh. I am pretty sure I checked this at the time I wrote it. They also have a new website (all the old links are not fixed) on which they have not yet put the metal-rimmed sinks (as far as I can tell). 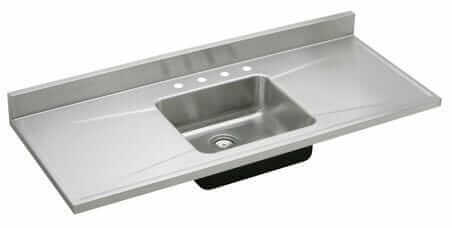 where can I purchase a san clemente metal rim double bowl kitchen sink? 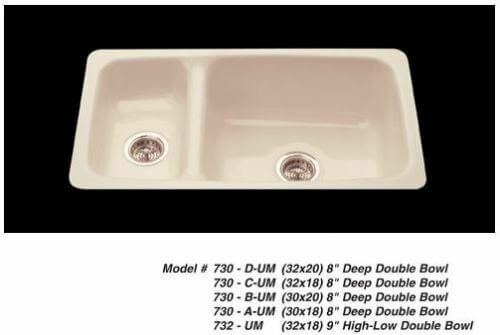 Denise, Click on the link in the story for Ceco Sinks to go to their website. 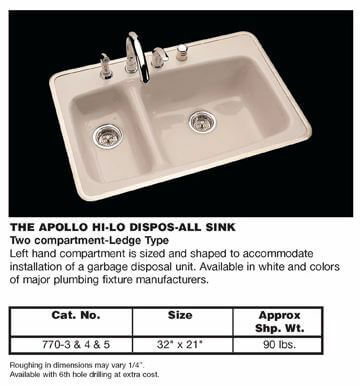 Hi Denise, contact the company that makes the sinks — Ceco. They are hotlinked in this story in bright blue.